We heard about the development of Taito's new mobile phone music-making software last year, but hadn't realised just how insane it is until today. 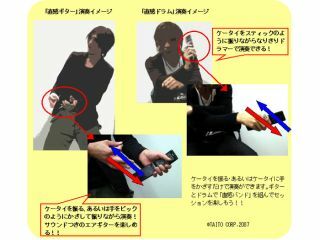 The Japanese firm's 'Chokkan Classic' game is finally available for recent NTT DoCoMo phones and uses a phone's infrared sensor and the willingness of players to create a Guitar hero-like experience on the go. While it's admirable that Taito hopes to introduce the masses to actually playing, instead of just listening to, music, the interface is so ridiculous we can't imagine anyone bothering with it at all. As this Reuters video shows, users are expected to not just pretend they're playing tiny guitars, but also to blow across their phones like flutes, or bow them like violins. The Taito demo in the video doesn't help itself by employing bods in orchestra wear to convince us of the authenticity of the experience. Perhaps it's us, but it only serves to underline the silliness of it all.